International Flavors & Fragrances India Ltd.
IFF is a multinational fragrance manufacturer with locations in more than 37 countries. The company headquarter is in New York. 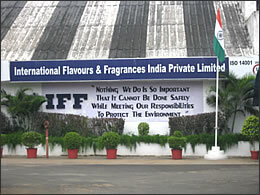 At IFF India, they develop and manufacture natural as well as synthetic flavorings and fragrances. Essences that are added to food products are called "flavors," and what is added to cosmetics are referred to as "fragrances." For example, the freshness that you taste when you chew gum comes from added flavors. What kinds of products do you use our instruments for? We measure refractive index for our flavor and fragrance samples as well as for its raw materials. Measurements are taken for more than 60 samples every day at the quality control room. How user-friendly is our RX-7000α? The RX-7000α takes measurements quickly, and its sample stage is easy to clean. We are very satisfied with the product. Does your company use the RX-7000α at other locations as well? 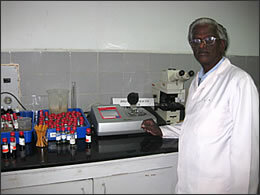 Besides Chennai, we use the RX-7000αat our factories in Jammu and Baddi. The RX-7000α has excellent performance. 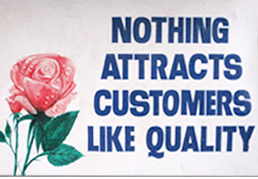 We found this written near the entrance of the factory: "Nothing Attracts Customers Like Quality" It represents well how much IFF cares about the quality of their products. We appreciate your continued support of ATAGO refractometers.